& I wanted to share them with you guys. First of all, meet Kelly at Kelly's Korner. I have been reading her blog for about a year now, it's on my blog roll & I check it every time she updates. Mostly her blog is about her life & her daughter, Harper...but at the very same time it's not "all about her" at all...she's so sweet & kind & loves people. She's always reaching out to people and making them feel special. Since she has over NINE thousand blog followers, I'm pretty sure I'm not the only one who thinks she's grand. I would definitely love to meet her in real life! Check out this blog entry here...be sure to go all the way down to the little video of Harper. This one was so precious, it made my day! 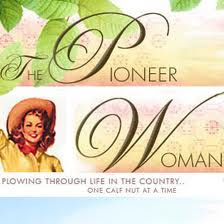 Ree Drummond, THE Pioneer Woman! Seriously, I don't think I've laughed so much reading a blog...ever! She totally had me at HELLO! she is absolutely hilarious & deliriously wonderful! Then there's TONI at Dazzle Design! I have poured over it with my mouth watering! it will TOTALLY Dazzle you! Get over there, you will love it! I want to also tell you about this new site I bought from recently. dress it up, dress it down...it's awesome! and it was not expensive! They have tons and tons of great things on their site (very similar to Anthropologie)...peek at their NEW ARRIVALS...control, must have control!! I had no idea I had such a talented woman living behind me!! She has two of the yummiest kids I've ever seen! I'm going to see if I can get her to monogram some little towels for me to use at the gym...whatever they wash their little towels with seems to HATE my face! go back to the gym & I DO IT AGAIN! The kind of snowy morning every school teacher in the south dreams of. because TODAY is Miss O's first BASKETBALL GAME! !